Found between webbed-together mimosa leaflets. Moved from Zygiella. I'm moving this to Z. nearctica based on known range. However, range maps may be outdated, so this move it tentative. but then we remembered that Metazygia looks like this. Will check deeper. Meanwhile Lynette or Mandy may comment. 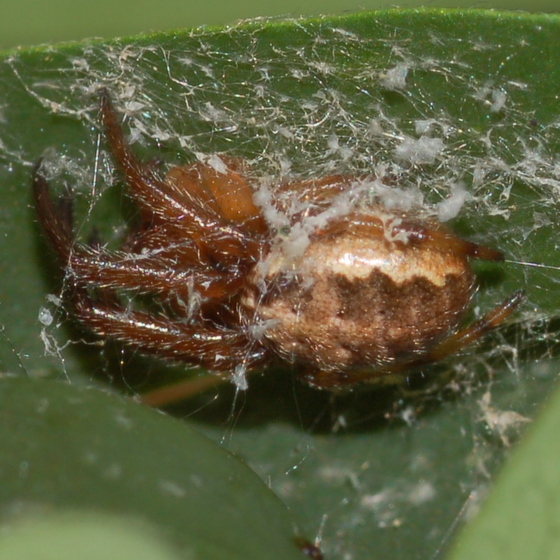 Nope, we're going back to first impressions, Larinioides. Metazygia doesn't actually look like this. Zygiella is my first impression. I certainly see the resemblance. I wish I had a non-scrunched-up view to add... I added a ventral shot, in case that helps somehow. Anyone have any thoughts about what the white chunks among the webbing would be? still looks good with ventral view (those always help). In my area if it's found on vegetation it's likely Z. atrica; if it's found on a building/fence it's likely Z. x-notata. I'm guessing it's the same there. (I can't remember anything about nearctica...it seems like that may be one that is rare?